The bathroom can be a difficult place to negotiate if you are elderly, physically challenged or rehabilitating. Safety Tub® and Luxury Bath® offer a variety of solutions that enable you or a loved one to be independent in the bathroom with their ADA accessibility products. The Luxury Bath® walk-in tub is registered with the U.S. Food and Drug Administration as a medical device and meets or exceeds HUD and ANSI Requirements. Clarke is one of the top bathtub brands. This bathtub has double-sealed, watertight walk-in door with a low threshold. In addition, it is L-Shape assistance bar and textured, slip resistant bottom. If the fear of falling while getting in and out of the bathtub has taken away the comfort of bathing, check out our many options for walk in bathtubs. Our Luxury Bath and Safety Tub lines are among the top brands available today. If getting into the shower has become a difficult two-person operation, check out our barrier-free shower solutions. We can install a barrier-free shower system with a shower pan that allows a wheelchair to be rolled right in. 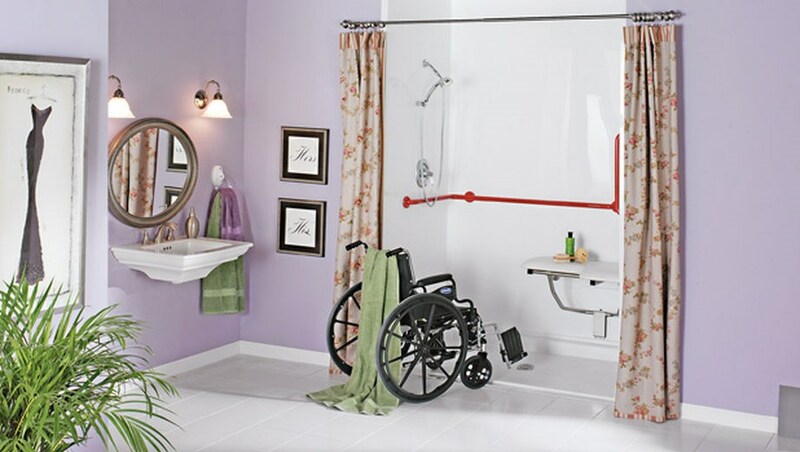 Our barrier-free, roll-in showers can conform to the standards of the Americans with Disabilities Act.